Of the four districts in Canyonlands National Park, the Island in the Sky District is the easiest district to visit in a short period of time. National Geographic's Trails Illustrated map of Island in the Sky District combines unmatched detail with helpful information to offer an invaluable tool for making the most of your visit to this extraordinary region. Created in partnership with local land management agencies, this expertly researched map features key areas of interest including White Rim Road; Green and Colorado rivers; Murphy Point; Stillwater and Labyrinth canyons; Grand View Point; and Dead Horse Point State Park. The map base includes contour lines and elevations for summits. Trails and roads include mileage between intersections, and river mileage is noted as well for those exploring by boat. Road types are differentiated so you know if the route you choose is a four-wheel-drive or high-clearance road. Mountain bike routes are color-coded according to difficulty. Handy trail and backcountry road summaries, and helpful information about backcountry safety, regulations, and permits is included as well. Recreation features are clearly marked, including campgrounds, picnic areas, points of interest, boat launches, and scenic overlooks. 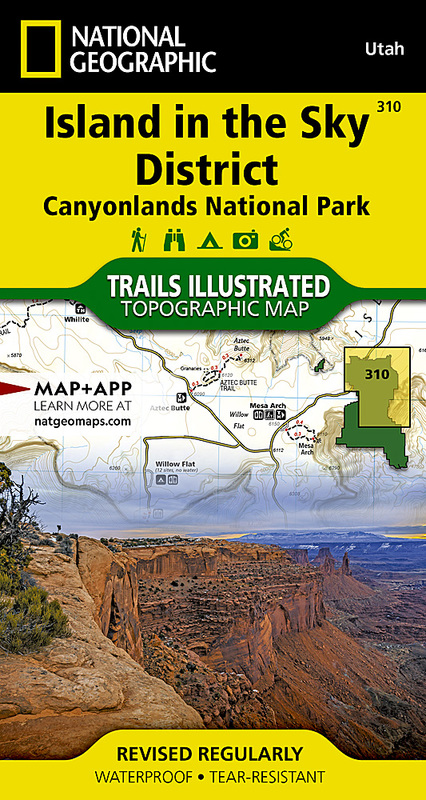 Other features found on this map include: Canyonlands National Park, Glen Canyon National Recreation Area, Green River, Soda Springs Basin.